The AIC’s online Bible Study series, Revelation: An Idealist Interpretation, is nearing its completion with the uploading this week of Episode Nineteen. The series will conclude in late September or early October with Episode Twenty-eight. Once the You Tube series is finished, I will start work on turning the script into an illustrated text with color illustrations to be published through the AIC Bookstore and offered on my Amazon Author Central page. 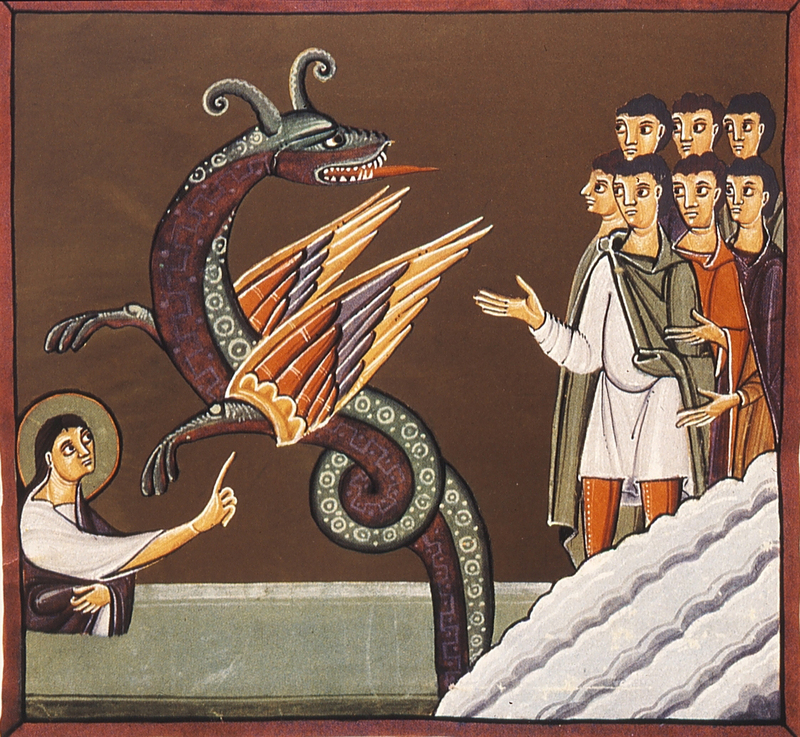 The new episode, focused on Chapter 13:11-18, The Beast with Two Horns, includes Folio 33 from the Bamberg Apocalypse. The central idea of Revelation 13:11-18 is the continuation of St. John’s “world upside down” parody plus additional parody of his own words, including a perverse variation on his “small and great, rich and poor” theme. Watch Episode Nineteen. A podcast version of Episode Nineteen is available using the Podbean gadget on the Digital Library page at the AIC website (www.AnglicanInternetChurch.net) and also through the iTunes podcast app (searchable using Anglican Internet Church or my name). Episode Twenty in the series, a long episode on Chapter 14, The Lamb and the 144 Thousand, is 95% complete and will be uploaded sometime during the week of August 23rd. Chapter 14 is the third of three chapters which form Act I of five acts of the “Divine Drama,” an early 20th Century system for organizing the second half of Revelation. The Beast with Two Horns recalls the image of the false prophets in Deuteronomy 13:1-5, and the teaching of Elymas in Acts 13:8-11. The parody presents unthinkable opposites to Christian belief: including idol worship and marking of foreheads with blasphemous labels which violate the first and second Commandments. At the end, St. John challenges readers to figure out the identity of the one whose number is “666.” I offer readers an explanation of how, in the 1st Century, the number of someone’s name is calculated, offering several examples, including Nero Caesar and Domitian Caesar and Jesus Christ, who is “888”, indicating a super-abundance of perfection, compared to “666”, indicating something far short of perfection (7). I also discuss some early Church debate over exactly who St. John meant and whether or not knowing the identity is really important in understanding Revelation.